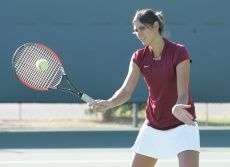 OJAI, Calif.—The Arizona State Women’s Tennis team showed their strength of heart on Thursday as they battled it out against the best of the Pac at the 2009 Pac-10 Championships at Ojai Valley Athletic Club. After a short weather delay, the team came out strong in Round One of Championship Singles play, as senior Laila Abdala swiftly put away Oregon’s Madelie van Rensburg 6-1, 6-1 to advance. Michelle Brycki followed suit, battling it out for a win over USC’s Gabriella Niculescu 4-6, 7-6 (5), 6-2. Nadia Abdala faced off against USC’s Alison Ramos, but was unable to overcome the Trojan, ultimately falling 7-5, 6-2. Sophomore Kelcy McKenna bravely took on Arizona’s Natasha Marks, but was defeated by the Wildcat contender 6-2, 6-4. The second round, however, would not be as successful for the Sun Devil team. Laila Abdala played with heart and took her first set against Stanford’s Jessica Nguyen 6-7, but would be unable to best the Cardinal player, falling 7-6, 6-3. While freshman Michelle Brycki kept a close eye on Cal’s Marina Cossou, she was ultimately defeated in a 6-3, 6-4 decision. Round One of Invitational Singles play started off rocky for the Devils as Ali Van Horne was unable to get the better of Oregon’s Siobhan Cavan, despite a monumental effort, falling 6-3, 6-1. Sianna Simmons quickly recovered for the Sun Devils, blowing the Ducks Trudie du Toit out of the water 6-0, 7-5. In Round Two, Sianna Simmons was unable to repeat her winning performance, falling to UCLA’s Stephanie Wetmore 6-2, 6-2. Ashlee Brown also found her opponent difficult to overcome, dropping her match against Washington State’s Aleksandra Malovic 6-3, 6-3. The Devils now move on to the singles consolation bracket and doubles play.